So speaking from a Thursday stand-point, pre-wisdom teeth removal, I knew I wasn't going to be able to eat for 6 hours before the surgery and was to only eat soft foods afterwards, so I told Brett he better treat me to something yummy. So, of course that included a little diner for chicken fingers and fries and a homemade ice cream from Temptations! Mmm in my belly. The girl at the counter said, "What would you like?" and I say, "I want what that little girl has outside!" and she scooped up two scoops of delicious Superman. Mmm, one of my favorites! 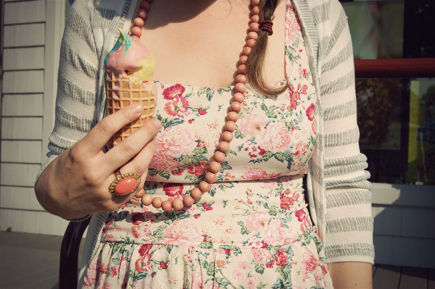 So, this dress has three favorite things about it. The first thing is that it's named after my very favorite blogger, Delightfully Tacky. Second, it has an amazing open-back. Third, of course, you all guessed it - pretty, floral print! You just can't lose with this dress! I wanted to go for a romantic look - pairing it with pastel and light accessories. Plus, mixing patterns, of course, is another favorite of mine! 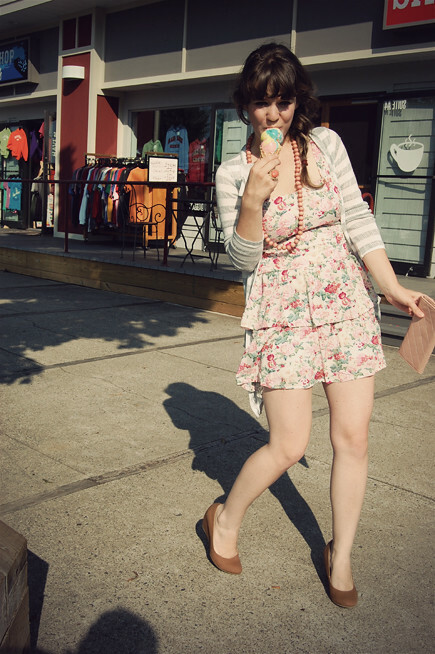 The perfect dress for an ice-cream date on the boardwalk. Sweet Temptations is so yummy. 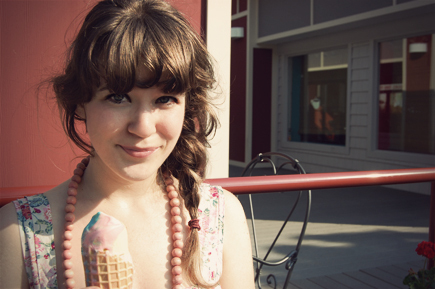 They handmake all of their own ice-cream and waffle cones. Plus, caramel corn, fudge, you name it. They have over 28 flavors of ice-cream! Yum! Typically I'm a soft-serve girl, myself, but I do love a good Superman, or Black Cherry or Cake Batter hard-serve once in a while too! Plus, it's a fun touristy spot in our town.